Many people don’t realize how easy fritters are to make until they try them. They're so versatile, and provide a tasty and seemingly impressive side to bring to dinner parties and potlucks. Fritters also make great batch-cooking snacks, whereby they refrigerate and freeze easily, ready to go when you need a little somethin’-somethin’ at the flick of an oven nob. 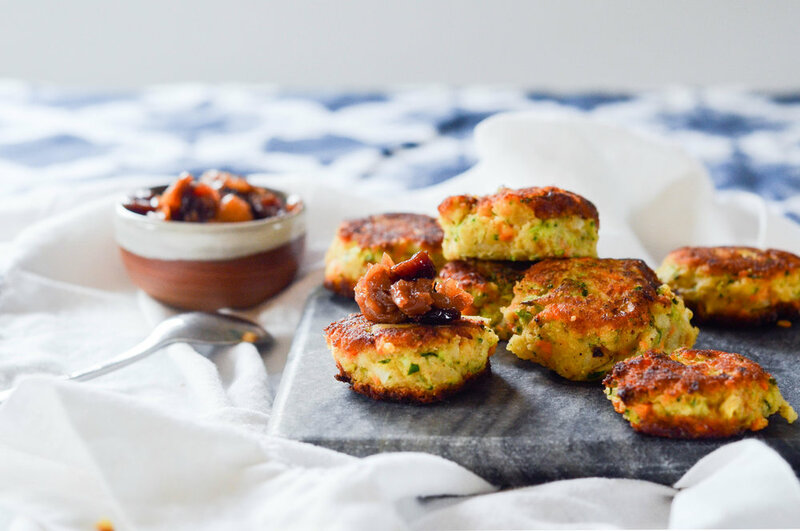 These fritters combine protein-rich chickpea flour with the flavourful and anti-inflammatory friendly spices of curry and cumin for a pakora-esque flavor that’s goes wonderfully with a tangy chutney or dollop of plain grass-fed yoghurt. In a large bowl, combine the flours, salt, spices, and baking powder. Add the water, stirring well to form a thick batter, and allow the batter to sit for 5 minutes or so, to soften the bean flour. Mix in the remaining ingredients, making sure that everything is evenly coated with the batter. Heat a large frying pan to medium heat and melt a substantial amount of cooking fat until there is a thin layer of oil coating the pan. Use two spoons to carefully scoop small amounts (1/4 cup or less) of batter into the preheated oil ((you can also gently form them into patties with your hands). Fry for a few minutes on each side, until the patties are golden brown. Transfer the cooked patties to paper towels to cool slightly before serving with toppings or sauce of choice (pictured here with apple cranberry chutney). *Note: If you notice the outside of the fritters are starting to char, and the inside is not cooking through, you can remove the fritters once they are golden brown on each side, place them on a parchment paper lined baking sheet, and finish them in the oven at around 400F until cooked through.